The Dreaming in Maille Earrings are quite unique with the use of a crystal rondelle within a chainmaille earring. They are light and comfortable on the ear. 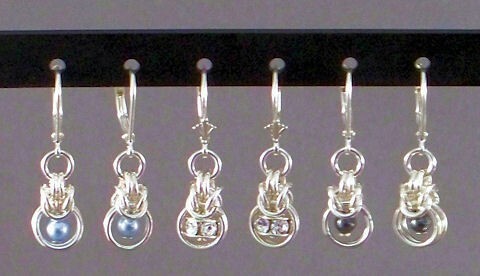 The center pair of earrings in the picture is what is supplied in the kit. As you can see, you can place crystals, Swarovski pearls and other beads or rondelles that will fit. This is a beginner weave. Swarovski crystal rondelles, sterling silver plated or gold plated leverback earring findings are included in the kit.